Researchers have created a 3D printed cosmic microwave background - a map of the oldest light in the universe - and provided the files for download. The cosmic microwave background (CMB) is a glow that the universe has in the microwave range that maps the oldest light in the universe. It was imprinted when the universe first became transparent, instead of an opaque fog of plasma and radiation. 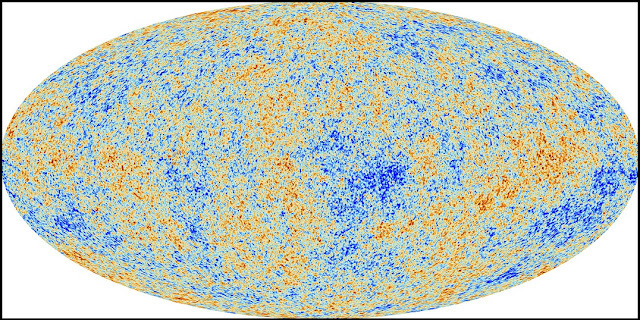 The CMB formed when the universe was only 380,000 years old – very early on in its now 13.8 billion-year history. The Planck satellite is making ever-more detailed maps of the CMB, which tells astronomers more about the early universe and the formation of structures within it, such as galaxies. However, more detailed maps are increasingly difficult to view and explore. To address this issue, Dr Dave Clements from the Department of Physics at Imperial, and two final-year undergraduate students in Physics, have created the plans for 3D printing the CMB. A paper describing the process is published today in the European Journal of Physics. Dr Clements said: “Presenting the CMB in a truly 3D form, that can be held in the hand and felt rather than viewed, has many potential benefits for teaching and outreach work, and is especially relevant for those with a visual disability. “Differences in the temperature of the CMB relate to different densities, and it is these that spawned the formation of structure in the universe - including galaxies, galaxy clusters and superclusters. The CMB can be printed from a range of 3D printers, and two files types have been created by the team: one for simple single-color structures and one that includes the temperature differences represented as colors as well as bumps and dips. The files for both types are free to download.